Logo embroidered shirts are an ideal way to promote your company. The embroidered polo shirt is one of the most common pieces of apparel used to promote a company or organization. Without question, there are many reasons to use them. There are certainly other pieces of apparel and items that can be used for custom logo embroidery. Embroidered polo shirts are by far and away the most popular. Everyone wears them. We all have a number of embroidered shirts in our closet. Custom logo embroidered shirts look good both on men and women. Some of the factors that make them so universal are that they are comfortable and fit most all body shapes well. They can be worn as a uniform, as a casual outfit or dressed up for a more formal affair. What is it that makes logo embroidered shirts so important? Tens of millions of polo shirts are sold annually in the United States-to both men and women. How many are in your closet right now? Needless to say, they have been a very popular style for decades and will most likely remain popular for years to come. Without question, embroidered shirts are very universal. One of the best reasons to use logo embroidered shirts is to promote your company. We would be willing to bet you have polo shirts you have been wearing for years. We are sure you have polo shirts that are at least 2 or 3 years old that you still wear. They wear very well and can be worn for years if cared for properly. Custom embroidered polo shirts come in a multitude of colors, styles and materials. The advancement in fiber technology means there is a polo shirt that can tackle most any situation. 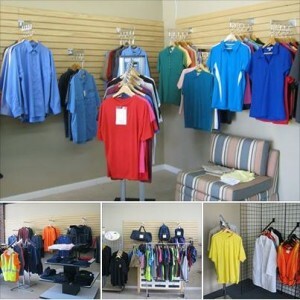 Whether for uniforms, promotions or premiums, a golf or polo shirt can fill your requirements. With color blocking and rapid dry materials, they can be worn in most any situation. Because of the versatility of polo shirts, you can find a style, color and material that will complement your brand and your company image. Logo embroidered shirts and apparel are great tools to bring focus to your company. Our In-House Art Department will work closely with you to ensure the logo embroidered shirts you receive are exactly the custom shirts you envisioned. From every fine line in the lettering and logo to the type of shirt, Spotlight Apparel aims for absolute perfection in every custom embroidered shirt we produce. We know you wouldn’t want it any other way. In addition, with the number of impressions that shirt will receive over its lifetime, the return on investment is very good for brand building. When you think about all the people that will see a logo on your shirt as you go about your day-to-day business, that’s a lot of impressions. That is a lot of brand building for a small investment in company apparel. That makes the return on investment very favorable for logo shirts. As you can see, choosing custom corporate logo apparel to outfit your company is a very smart decision. Be sure to contact Spotlight Apparel, Inc. of Jacksonville Florida for all your embroidery needs. Posted in Embroidery and tagged corporate logo apparel, custom embroidered logo apparel, custom embroidered polo shirts, custom embroidery, logo shirts.